Held the Saturday before Mother's Day -- Held annually since 1978, Nettie Davenport Day is sponsored by the Chamber of Commerce and highlights the community's heritage with prize drawings sponsored by all local businesses, all kinds of children's bike & trike races, other games and contests, an arts & crafts show, live musical entertainment, and recognition of youngest and oldest persons present, couple married the longest and mother with most children present. 2014 will mark the 93rd Annual Davenport High School Alumni Reunion. 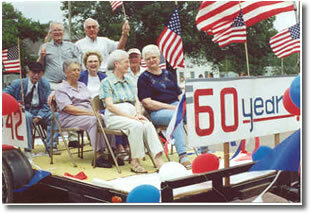 Many individual class reunions are held, and an annual parade, which always has more than 70 entries entered including classes riding in decorated floats, is held that afternoon. (The parade is thought to be the only one of its kind that goes down brick-paved Broadway Ave., makes a u-turn and comes back up Broadway, so everyone in the parade also gets to see the other parade entries. It stems from days when dragging up and down Main was the popular thing to do.) Prizes are awarded to the best floats, and a large banquet, usually attended by more than 400, is held in the gymnasium that evening where many traditional events are held and awards presented for oldest alumna present and graduate coming longest distance, etc., and a college scholarship is awarded to a DHS graduating senior. Held the 3rd or 4th Weekend in August -- Annual Davenport Community Fair -- the oldest continuous community fair held in Lincoln County --features livestock entries of local school youths and adults in the area, as well as home crafts entered by all ages. The event climaxes with events that include a parade of champions with trophies awarded for top fair entries. The fairgrounds are located three blocks west of Broadway at the end of 2nd Street. Held the 2nd Saturday in December -- An annual tradition in Davenport dating back to the post World War II era when the event was called a "Christmas party". Decorated floats with cash prizes awarded by the chamber add interest to the parade which is always brought up in the rear by Santa Claus and Mrs. Claus who are escorted by Davenport's Volunteer Fire Dept. and all of its units. More than 400 sacks of treats are distributed by the chamber to children and senior citizens every year, and all businesses in the community give away more than 20 free prizes in drawings held after the parade. The Christmas parade is held along Broadway.